In college, some friends of mine committed to having fresh flowers in their dorm room year round. As soon as one bunch of flowers lost its burst of color or began to wilt, my friends would replace them. I didn't really understand the appeal at that season in my life. But I do now. There's just something about fresh flowers in the home. 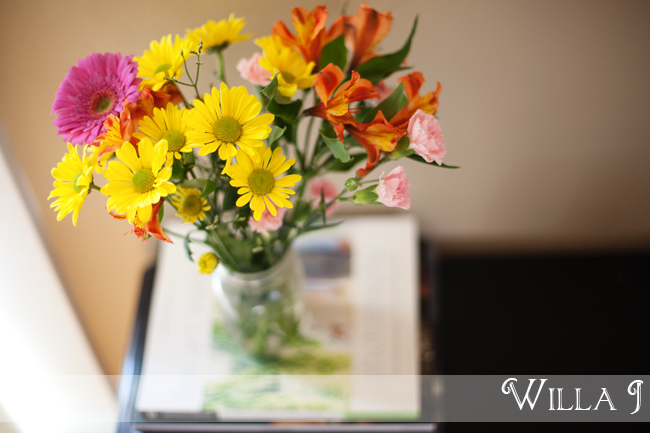 I love a splash of color in the living room corner, on the dining room table, or atop the kitchen counter. We don't have them in our house year round--I'm definitely not that organized! But, at $3.99 for a small bunch, it's worth it every once awhile:). Have a wonderful week!